Have been working through some of the Census data and the gender gap works both ways depending on the group as the above chart indicates. The gender wage gap remains a pertinent issue in Canada, despite how long women have been lending their labour to the workforce. And we often hear statistics that contrast two categories: men and women. On this, the numbers are stark. But that data doesn’t incorporate ﬁlters around identity and background of women, an omission that effectively erases the compounding discrimination faced by non-white women in Canada. A lens that compares only men and women sets up women’s rights as a replica of patriarchy, where one group is favoured over everyone else; in doing so it reinforces the rigid power structures that have brought us to this point. But including race in the analysis reveals a different kind of gender gap that’s perhaps even more alarming than the broader issue. 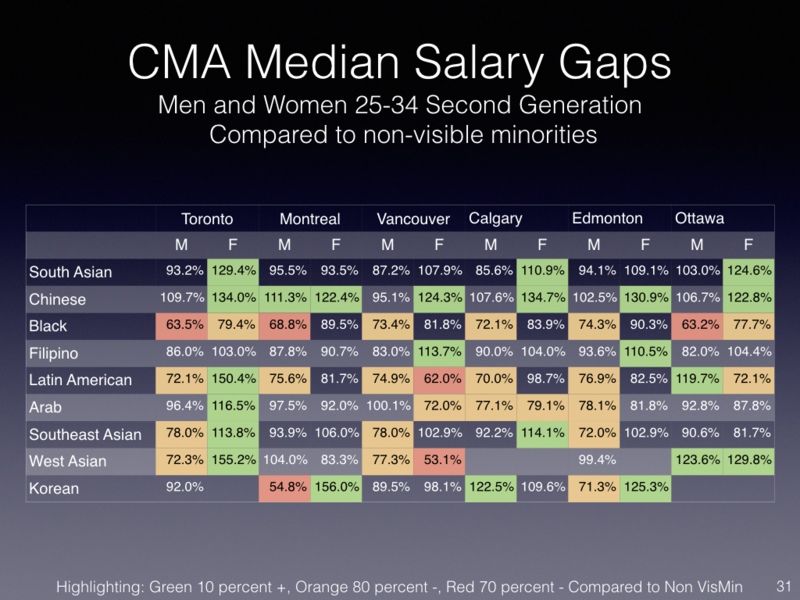 How are we closer to gender parity in Canada when the gender gap we often think about ignores the unique struggles of women of colour and Indigenous women? If white men are still making more money than white women, can this be acknowledged while addressing the fact that women of colour fall far below both? If we actually believe in the principles of equality with which Canada so proudly associates itself, we must acknowledge both crises: the gap between men and women, and that between racialized women and everyone else.